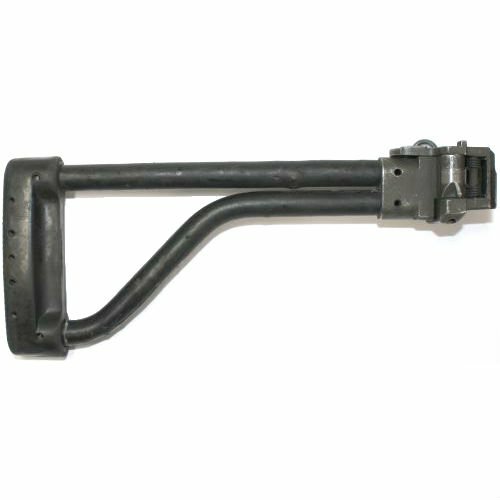 Looking for a Polish Beryl folding stock, or a commercial copy in the same style. Anyone happen to know where one could be had? I know Gun Broker is an option but I didn't know if a company out there made a look alike. I think FB only made 1 basic pattern of side folding stock for the WZ96 Beryl. It was metal w/ an overcoating. About a decade later, the design was updated to an M4 style collapsing stock. It has a metal core but is a poly stock otherwise. It has for adj positions but does not fold. FB did experiment with a folding & collapsing stock, but it never went into military service. The only place that I know of that carries the original folder from time to time is RobertRTG. I have asked Arms of America about them and was told that FB-Radom no longer makes the folder, so that means no matter what, you're pretty much stuck with the 2nd market; either here or in Poland. AK Builder sells a copy if the metal tube folder. I have one on my Tantal. It’s GTG. All I see is the wire style. The beryl tube folder looks like this. I want one too. There have been several stock designs for the Beryl. Romania has bought a bunch of the later style ones from Poland. The 7.62 Beryl made for Nigaria has one of the later style stocks. Yeah, I just looked and don’t see it on there. I think it was Ak Builder? I read in a Polish magazine that the M4 style stocks were bought from Leapers UTG, so they didn't even make those apparently. We also have a new version specifically for the Beryl or FOX that works with the Beryl scope mounts. Hell yeah dude. I am definitely buying one. Can you explain the different styles? Edit: nevermind, I see the first link has pics. Galil style is what I want. Even comes in NATO length for normal humans. Last edited by Spengo; 02-12-2019 at 01:54 AM. Excellent. I will be buying a Fox rifle folding model very soon. The Bonsteel side folders are pretty sweet and look very close to the original Gen 1 Beryl stocks plus they add a 922 R part . Atlantic Firearms will be offering the Bonsteel Side folder and a Side folding M4 collapser on some new WBP Fox models in the near future . We have tested these on some of our standard AK47 Rifles and they are very stout ! Very nice. I'll vouch for the stoutness of the Bonesteel folding stocks. I've had one of my VEPR for a little bit now and it's rock solid. Deploying a folded Beryl stock requires minimal effort. Doesn’t opening and closing a Bonesteel folder require articulating the stock parallel to its hinge.. a bit of effort by contrast? Deplyment is very easy, just a flip of your fingers, they dont "lock" folded, but rather have spring tension against a ramp. Folding requires more effort, have to push down on the stock. Got the stock, it's pretty sweet. Exactly what I was looking for. I do have a question though. I noticed that none of my QD swivels can fit the metal D ring on AK slings through them. Does anyone have a recommendation for a QD swivel that fits AK slings? Last edited by Spengo; 02-26-2019 at 01:26 PM. Not sure if this is what you are looking for but I have used one for about 4-5 years with no complaints. Universal “u” loop, designed for the scar originally I believe. Edit: looks like it may be discontinued now, I found one just like the one I use on ebay. Last edited by Okieundercover; 02-26-2019 at 09:11 PM. TL-QDSW18 is the part number. Ordered the same stock for my Fox. Thanks for the awesome picture. I have the same rifle and got the Nato length also. I'm going to mount a Primary Arms 3X prism scope on the beryl rail that I bought with the rifle.